Every year before Halloween E-Poll comes out with a list of this year’s creepiest celebrities. 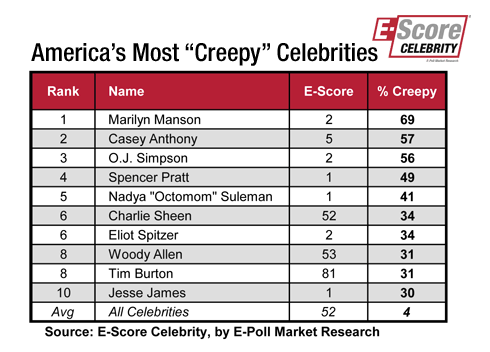 From the 2011 list, Spencer Pratt, Octomom and Eliot Spitzer continue on the list from last year, Marilyn Manson and O.J. return after a year’s absence (from the 2009 list); Casey Anthony, Charlie Sheen, Woody Allen, Tim Burton and Jesse James are first-timers on the creepy list. How come Nancy Grace isn’t on this list. Talk about creepy. @Greg, Nancy Grace is in the top 10% most creepy of all the celebrities (6500+) we’ve surveyed, but that’s not enough to get her on this list.